The authors were Thomas H. Milhorat, M.D., Paolo A. Bolognese, M.D., Misao Nishikawa, M.D., of the Department of Neurosurgery, The Chiari Institute, North Shore-Long Island Jewish Health Systems; Nazli B. McDonnell, M.D., PhD., of the NIH National Institute on Aging; and Clair A. Francomano, M.D. of the Greater Baltimore Medical Center. The article, titled, “Syndrome of occipitoatlantoaxial hypermobility, cranial settling, and Chiari malformation Type I in patients with hereditary disorders of connective tissue”, examined patients with CT as well as the FONAR UPRIGHT® MRI. The conclusion of the study was to report a previously unrecognized association between Chiari Malformation Type I (CM-I) and Hereditary Disorders of Connective Tissue (HDCT). The study occurred between January 2002 and April 2007 and involved 2, 813 patients, of which 45% were referred for evaluation after failed Chiari Malformation surgery. FIG. 6. 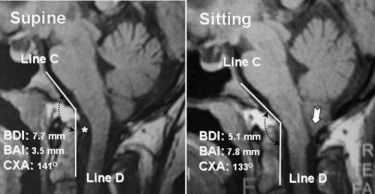 Results of vertical MR imaging in a 27-year-old woman with HDCT/CM-I. Midsagittal image in supine position (left) showing normal basion–dens interval (7.7 mm), normal basion– atlas interval (3.5 mm), normal clivus–axis angle (141°), large retroodontoid pannus, and low-lying cerebellar tonsils. On assumption of the upright position (right), there is evidence of cranial settling (2.6 mm decrease of basion–dens interval), posterior gliding of occipital condyles (4.3 mm increase of basion–atlas interval), anterior flexion of the occipitoatlantal joint (8° decrease of clivus–axis angle), increased basilar impression, and cerebellar ptosis with downward displacement of cerebellar tonsils to C-1 (white arrow). Note the greatly increased impaction of the foramen magnum anteriorly and posteriorly. Line C, superior plane of the clivus; Line D, plane of the posterior surface of the dens. Asterisk indicates the retroodontoid pannus. The primary diagnostic tools utilized in the study were 2D reconstructed CT and upright X-ray radiography. The final stage of the study included examinations of patients in the FONAR UPRIGHT® MRI for comparison. The authors described, for the first time, the phenomenon of “cranial settling”, occurring in patients with both Chiari Malformation 1 (CM-I) and Hereditary Disorders of Connective Tissue (HDCT). The Chiari Institute is the world's first comprehensive, multi-disciplinary center for the management of patients suffering from Chiari Malformation (CM), a rare structural condition that affects the cerebellum; syringomyelia, a chronic disease of the spinal cord; and related disorders. The Chiari Institute was founded in 2001 by Dr. Thomas H. Milhorat, chairman of the departments of neurosurgery at North Shore University Hospital in Manhasset, N.Y., and Long Island Jewish Medical Center in New Hyde Park, N.Y., and represents the fruition of his decade-long effort to establish an institution dedicated to the treatment of these often misdiagnosed conditions. The Inventor of MR Scanning™, Full Range of Motion™, pMRI™, Dynamic™, Multi-Position™, True Flow™, The Proof is in the Picture™, Spondylography™ and Spondylometry™ are trademarks and UPRIGHT® and STAND-UP® are registered trademarks of FONAR Corporation.